It turns out there are a few things which aren’t available or supported when using Search Folders. This is disappointing to say the least, given how flipping useful search folders are within the Vault Client. You have to right click on the file, select ‘go to folder’ once you are there, the Properties option appears in the File menu. In my opinion its counter intuitive and inefficient having to go to the File menu anyway, you should be able to access a files properties in its context menu, just like you can in most Windows based applications. Its a tad annoying this UI convention hasn’t been respected here. Especially since it turns out there are some important settings within the File Properties dialogue. Anyhow, since I’m now aware of Search Folder UI limitations, I will just continue to add them to this post as they pop up. Again please share them with me in the comments, on Twitter, or in the Autodesk Discussion Group. I’m pleased to say Autodesk have made an improvement to the UI with regards to the above issue from Autodesk Vault 2013 onwards. The File Properties command is now available in the File menu from within Saved Search Folders, so you don’t have to go to its source folder to access it. However, I believe it should be in the context menu as it is for folders, which is another inconsistency…. nevertheless, thanks to Autodesk for removing a few clicks from within this particular workflow. 5. Enter the path of a template that you would like to use or click the Browse button to navigate to the desired template. The last selected report template is displayed by default. 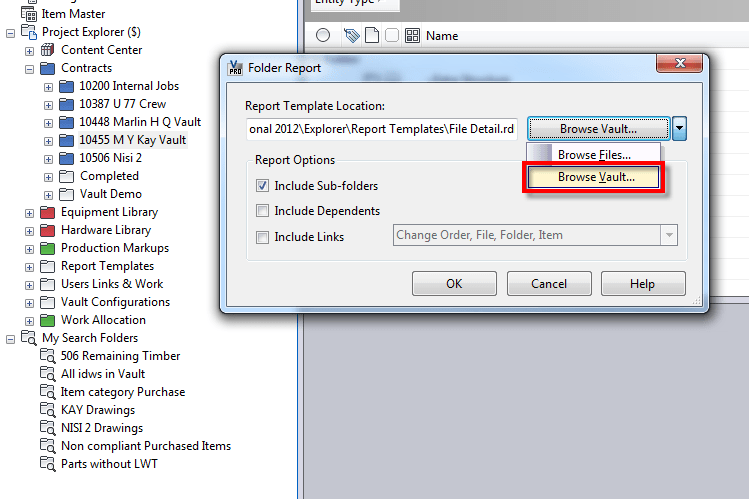 Note Report templates may be stored in a local folder or in a vault. However, you only get the option to select a report from Windows Explorer within the Find tool and also when running a report on a Search Folder. I’m going to submit an edit to the Wiki clarifying this difference. This is more of a mild inconvenience than anything else, it means you have to keep your local copies within your Vault working folder up to date.